Source: USB.org, sponsored by USB Implementers Forum Inc. The Universal Serial Bus (USB) had a significant speed boost in less than a decade. The initial USB specification emerged in 1996 at data transfer rates of 1.5 Mbps/low speed and 12 Mbps/full speed. The technology gained wide use after the 1998 release of the 1.1 USB specification. USB 2.0 boosted the speed to 480 Mbps in 2000. The USB 3.0 specification, later referred to as USB 3.1 Gen 1, vaulted the published speed to 5 Gbps in 2008, and USB 3.1 Gen 2 pushed it to 10 Gbps in 2013. 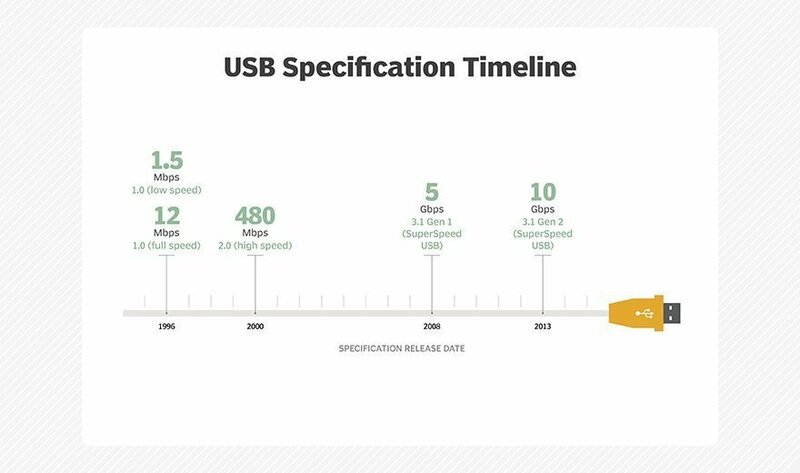 The first generation of the 3.1 USB specification -- marketed as SuperSpeed USB -- uses improved encoding to receive and submit data, and the sequential read and write speeds increased in tandem. However, due to data-encoding overhead, the 5 Gbps speed is reduced to about 4 Gbps of raw throughput. The 3.1 Gen 1 upgrade made USB viable for delivering video in addition to its general use for flash drives, enclosures and mobile devices. The USB specification 3.1 Gen 2 upgrade is known as SuperSpeed USB 10 Gbps. New SuperSpeed USB 10 Gbps devices released in 2016 have enhanced Power Delivery features and improved data encoding efficiency. The USB Power Delivery specification eliminates fixed power direction, allowing either the host or the peripheral device to provide the power for faster speeds. It can deliver up to 100 watts bidirectionally over a USB cable at the same time as audio, video and data. In addition to USB speed upgrades, a new plug design called USB Type-C was created to enable USB computers and devices to use a single, smaller, reversible cable. Apple MacBooks, Google Chromebooks and some smartphones use the USB Type-C ports, and more are expected as USB Type-C adoption increases. What sorts of new USB drive use cases are emerging?